What I actually found most impressive when I decided to join TEDxBerlin 2011 as a speaker was the amount of preparation that goes into these TEDtalks. TEDxBerlin offers each speaker personal coaching sessions with Ole Tillmann in the weeks before the conference takes place. In addition there is a final rehearsal on the evening before the event so everybody gets to practice his talk on stage and gets used to beamer, cameras and lights. This preparation is so important. And it makes such a difference! How many conferences and events do we all know where speakers just give a standard talk or presentation with overloaded slides and little preparation and passion? TED is different. Here the speakers feel the responsibility of giving the best they can to a highly involved and interested audience. You don´t want to waste people’s time and you want to give the talk of your life. And not just another standard presentation. A further important factor that adds to the quality of the talks is the fact that TED limits your talk to a maximum of 18 minutes. This leads to clearer thoughts, a clearer structure, stronger take-aways and a more concise train of argumentation of the speakers. You can´t spend too much time on irrelevant points that don´t bring across a message and you have to focus on the important points you want to state, because you have limited amount of time. 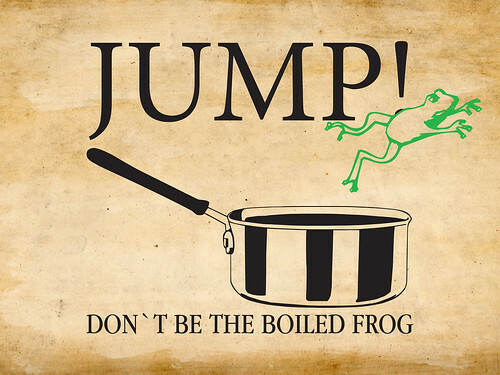 The topic of my talk was „Don´t be the boiled frog – jump“. It was about companies getting too comfortable in their comfort zone. They start losing their alertness and energy to constantly question and reinvent themselves. They behave like the frog in the warm water that misses the point to jump out of the pot before the water starts boiling. I shared 5 lessons learnt from Young Internet on how we pushed ourselves out of the comfort zone and the hot water and how other companies can do the same. I truly believe it will be those companies that will be successful in the future that don´t wait until the water boils and that don´t wait until the platform is burning, but that stay entrepreneurial, stay hungry and actually jump to reach the next level. Great, I will take a look and give you my feedback!